When I was in high school (in the 1980s) I went on student exchange to Germany. One thing that stands out in my memory of this time was my host family’s approach to recycling. I watched my host parents do things like separate a teabag into: tea leaves (for the compost), bag and dangly label (for paper recycling), staple (for metal recycling) and string (for the rubbish bin). My host parents were not ‘extreme recyclers’ – they were normal – Australians were simply a long way behind. I’d like to think there are things we can teach our own children to help the environment. 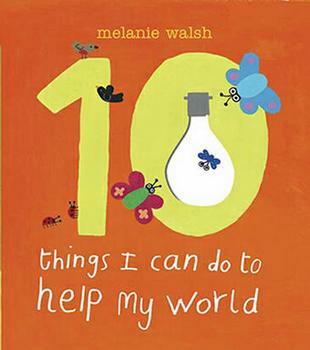 Ten Things I Can Do to Help My World by Melanie Walsh is a simple book about things that everyone can do to help conserve their world – and it is written specifically for preschoolers. The book covers the major areas of environmental concern including conserving energy and the importance of conserving diversity in nature and recycling. Each topic is covered simply with an easy-to-do action, such as turning off lights when leaving a room, or choosing to walk somewhere instead of drive. The book features bright, bold illustrations and lift-the-flap sections – always a winner with preschoolers. The book is also written in the first person, which is a nice approach as it gives your child ownership of the actions from the outset! Ten Things I Can Do to Help My World is available from Fishpond for $14.99.